There are certain recipes that get bumped up to the top of my to-bake list. When I saw this in my Google reader, I knew this was one such recipe. How could it not be? Not only does it have chocolate and caramel, it’s made in a pan and can just be sliced. With that said, the bars are a bit time consuming–you have to unwrap caramels (I still can’t find the unwrapped baking caramels anywhere in LA!) and there is a melt on the stove step, but they’re definitely worth the fuss! An oatmeal cookie base, gooey chocolate layer (with pecans if you don’t think, as I do, that nuts ruin everything), and oatmeal and caramel top. It really doesn’t get much better than that, does it? I think the next time I make these (trust me, there will be a next time), I’ll sprinkle some sea salt in the chocolate mixture because I’m still on my salty-sweet kick. Preheat oven to 350 degrees F; coat a 9 x 13-inch baking sheet with nonstick spray. Cream butter and both sugars in a bowl with a mixer until light and fluffy, about 3 minutes. Add the egg and mix to blend, followed by the flour, baking soda, and salt; mix to incorporate. Add in oats and mix on low speed until incorporated. Crumble 2 cups of dough over the bottom of the prepared baking sheet. Press to cover base of the pan (don’t push dough up the sides); set aside. Add halved caramels to remaining dough, working them in with your fingers; set aside for the topping. Melt chocolate chips, condensed milk, and cocoa powder together for the filling in a saucepan over medium-low heat. Cook until mixture is smooth, stirring constantly to prevent scorching. Remove from heat and stir in the pecans and vanilla. Pour the filling over the dough in the pan and spread evenly. (I used an offset spatula to do this.) The layer will be fairly thin. 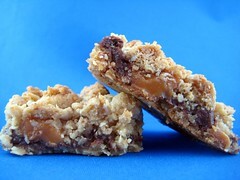 Crumble dough with caramel pieces evenly over the top of the chocolate. Bake bars for 30 minutes, or until chocolate is set and topping is firm. Cool bars completely before cutting. Recipe adapted from Culinary Concoctions by Peabody. I’ve been futzing around with creating a recipe just like this, but just haven’t managed to get it “just right.” You’ve just made my day with this one — off to buy more caramels! BTW, don’t feel bad you can’t get unwrapped baking caramels in LA. Here in Israel they don’t even sell them wrapped in the supermarkets. I have to go to a specialty candy kiosk and pay top price to buy them individually. Hmm, maybe I’ll make these for the bake sale instead! I found unwrapped caramel bits at Target in the baking aisle. No idea if they’ll ever have them again, of course. Gah, I have to make these for our next gaming session. They look amazingly delicious (what kinds of caramels do you use for these? ).